Sunday roasts aren’t something we mess around about. We know Sunday is the golden day of the week a time for putting your feet up, eating a hearty meal, and taking a breather before getting back to work. That’s why we want to direct you to the best roast dinners in Bow and Globe Town, as recommended by our readers. On our list we’ve included price comparisons and the deals for your meal. Of course, we know a Sunday lunch isn’t just about the price, but what you’re paying for. 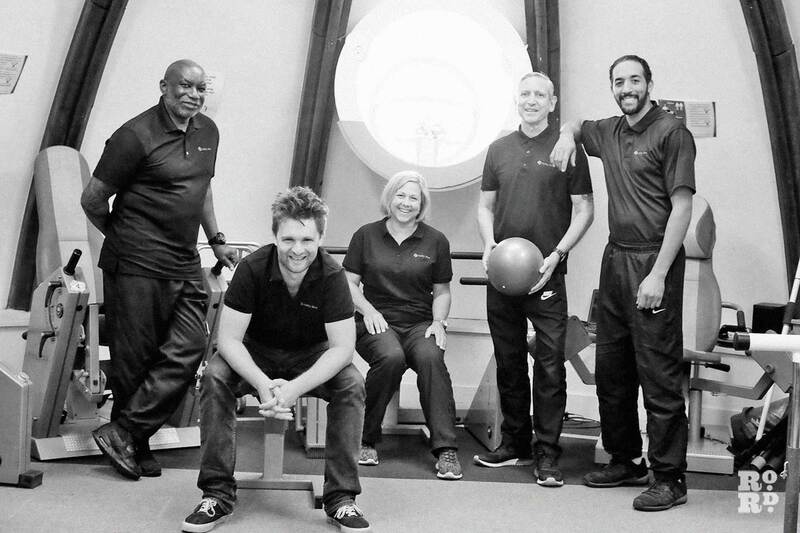 So we’ve also put in the quirky, the comfortable, the unpretentious, the atmosphere and anything else we feel you need to know before you go. These pubs have been selected by readers who know what they like, and they all have vegetarian options. The Coborn strives for comfort, wanting locals to view them as a home away from home. There’s plush armchairs, a spacious entrance, a blanket tub for chilly customers, and a good old-fashioned fireplace to sit beside with a cuppa. 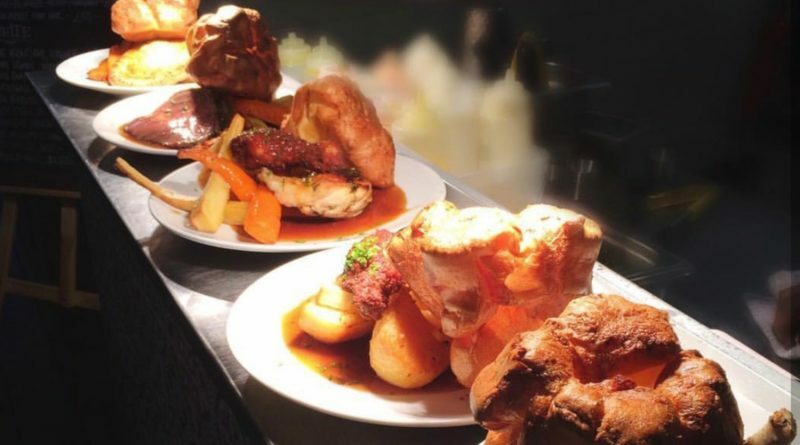 These are the things you want in your Sunday roast destination, especially when the weather is biting. Step into the Coborn and every chair is calling you, with each table having a Penguins Classic as a menu holder to peruse and further revel in the ‘mi casa es su casa’ vibes. We recommend their beef roast, which is Aberdeen Angus, served medium rare or to your liking, and putting that with their Bloody Mary. After your meal, The Coborn recommends their cult Sunday pub quiz from 7:30pm which is almost always fully booked. 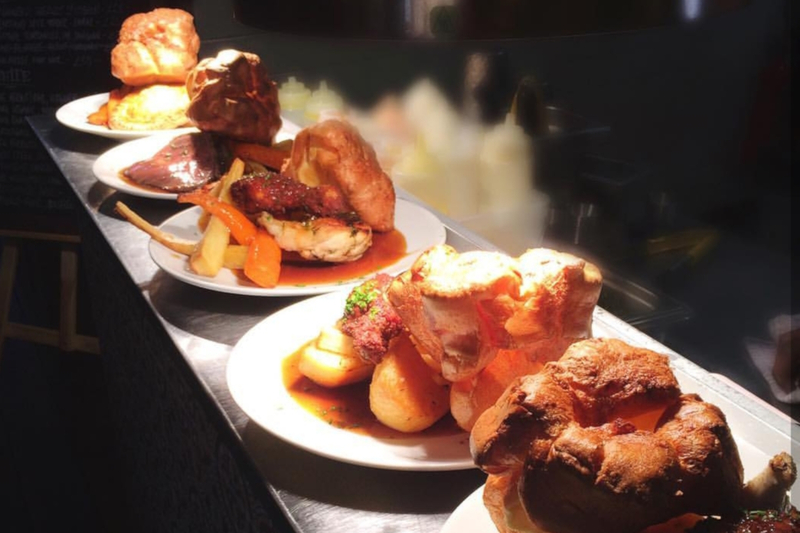 All roasts are served with double egg Yorkshire pudding, plenty of seasonal vegetables, goose fat roast potatoes and gravy. Their cheapest roast comes at £14.25 and £15.75 for a meat roast. The Crown is perched at the end of Grove Road and looks out onto scenic Victoria Park. 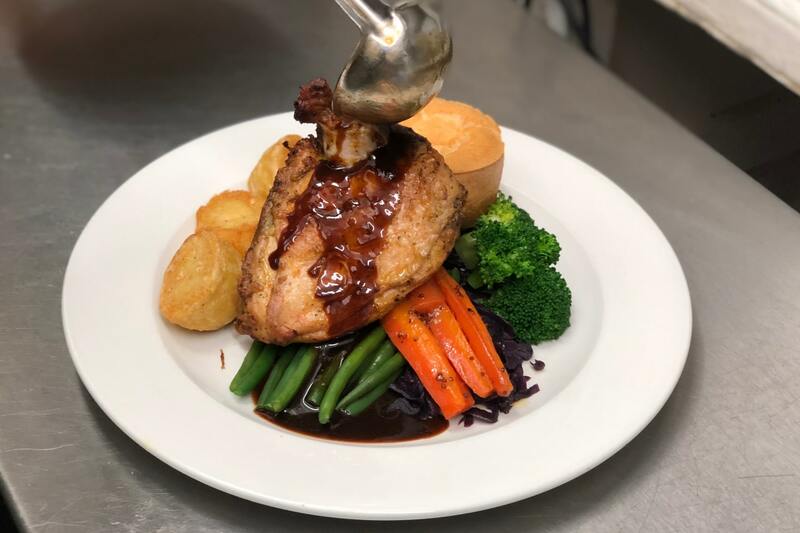 It’s a Sunday roast staple for the area with their spacious ground floor, two beautiful dining areas upstairs and balconies that look out at the leafy crowns of the trees by the park gates. If it wasn’t so unpretentiously East End, perhaps the sight would make you forget you were in the city. The Crown has comfy spots tucked away, and friendly staff waiting at their bar. They also do changing sharing roasts weekly, like pork knuckle and tomahawk. We’d recommend their most beloved option: the 21 day aged West country Sirloin Beef, and one of their many craft beers while you’re there. All roasts are served with Yorkshire pudding, roast potatoes, winter greens heritage carrots and gravy. 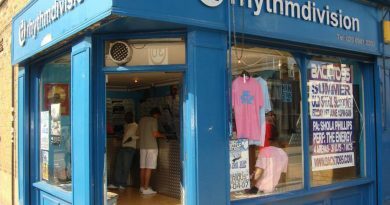 Their cheapest roast comes in at £13.95 and £15.00 for a meat roast. Chiringuito, usually in our articles for its trendy cocktails, finds its way into our roasts lists too. Named by some of our readers on Facebook as their ‘go to’ on a Sunday, we had a look and taste to see for ourselves. This beach-bar-style cafe is very modern, with mood-lighting and colourful mural art on the walls. It’s a great place to meet with friends for cocktails, combining its East London charm with Spanish and Latin inspired dishes. It’s conveniently just outside Bethnal Green station beside St. John’s Church, and has a roof-top terrace and patio for the summer. 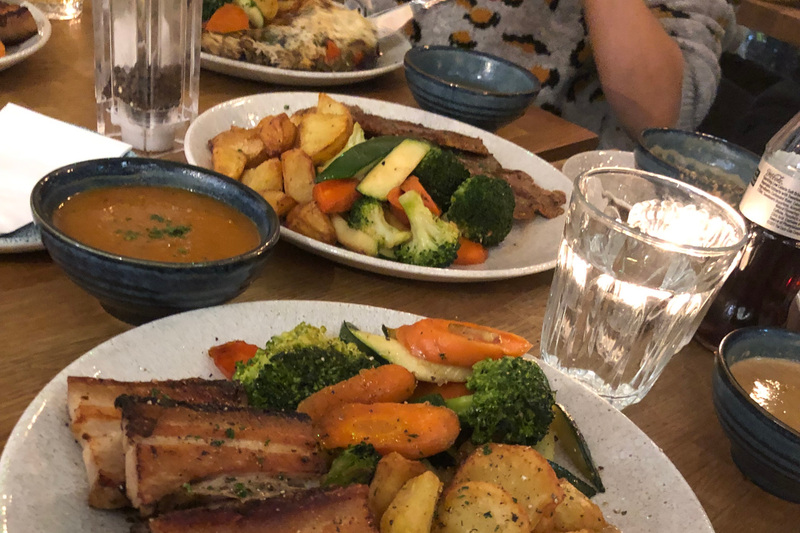 Their vegetarian roasts, the baked aubergine, and their pork belly roasts are delicious, with well-cooked vegetables and excellent tasting gravy. The menu even has a suggested drink to go with each roast, so you needn’t pour over the drinks menu for too long. 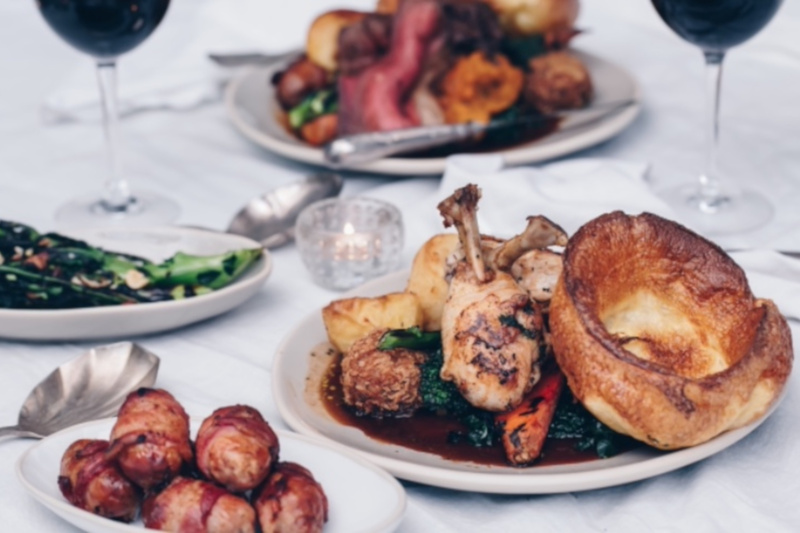 This is the perfect roast destination if you want to wash your meal down with delicious cocktails and have a relaxed catch-up with friends. The Approach Tavern in Bethnal Green focuses on the unpretentious, with real fires and real ales. They have a daily changing menu that focuses on delivering hearty food, and makes sure diners don’t get bored of the same meals. With award-winning wine and beer coupled up with a warm fire to keep you toasty even through the winter months, there is something here for everyone. The pub is dog-friendly and has a great family atmosphere. 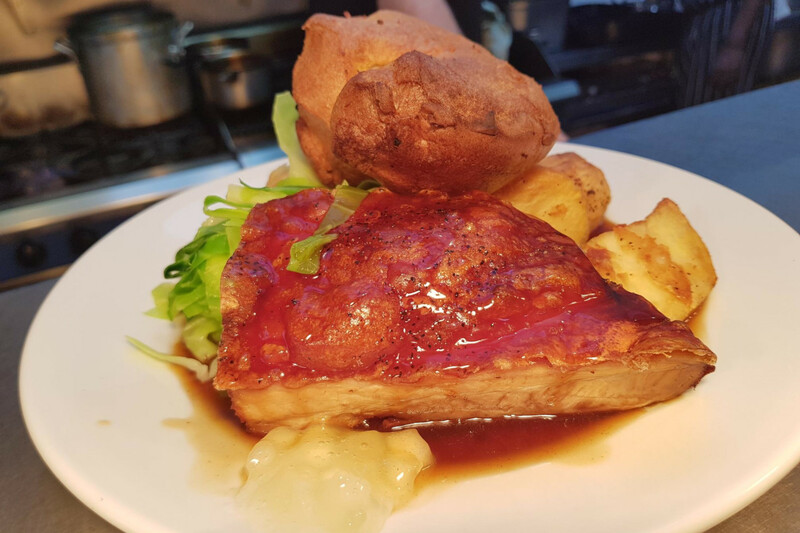 All served with roast potatoes, seasonal vegetables, Yorkshire pudding and gravy. Lord Tredegar is another typically East End – no messing around – pub that serves great food and knows it. The chef commented that, ‘The key to a good Sunday Lunch is the freshness and quality of what you serve. We have a great bunch of suppliers that provide us with top quality ingredients. We also try to be consistent with what we serve so our loyal customers know they’re getting the best roast around’. Especially good here is the Sunday Roast gravy which takes a full 24 hours to get just right. 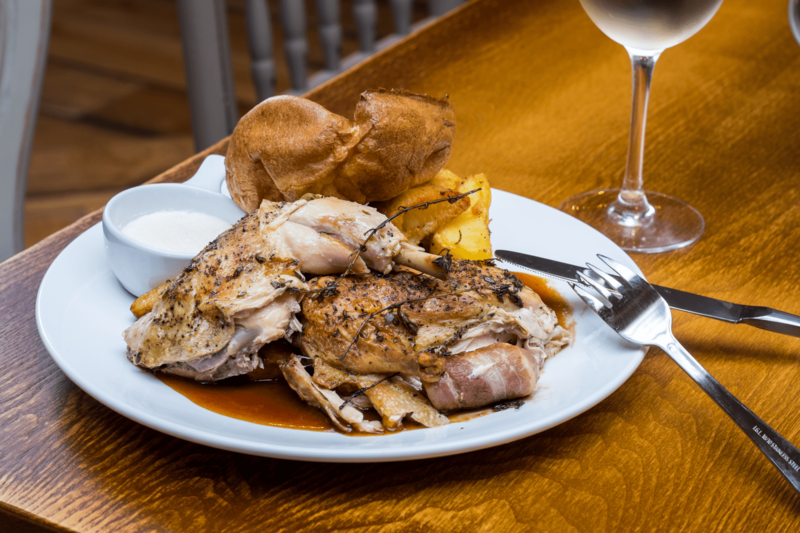 The Tredegar offers a children’s roast, and has the good atmosphere for a family meal out. They also have a pretty beer garden, a huge world map decorating the room and a more private seating area in the rear. All Served with Yorkshire pudding, Rosemary Roast Potatoes, Bashed Swede, cauliflower cheese, fresh vegetables and Red Wine Gravy. Their cheapest roast comes in at £13.50 and £14.60 for the meat roast. 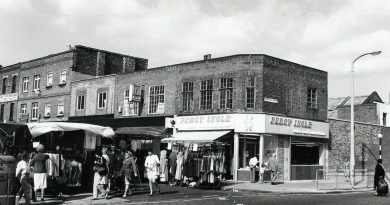 The Victoria on Grove Road in Mile End makes the list too. There’s wifi, a large board game collection, a coffee area and a mix of dining tables, bar tables, and some comfy sofas to fit everyone’s pub needs. There are more dining areas upstairs for a more private fine dining setting. Famed for their incredibly large Yorkshire puddings, The Victoria also has a ‘bottomless veg and roast potato’ top up deal with all their roasts upon request, so that none of their customers go hungry. 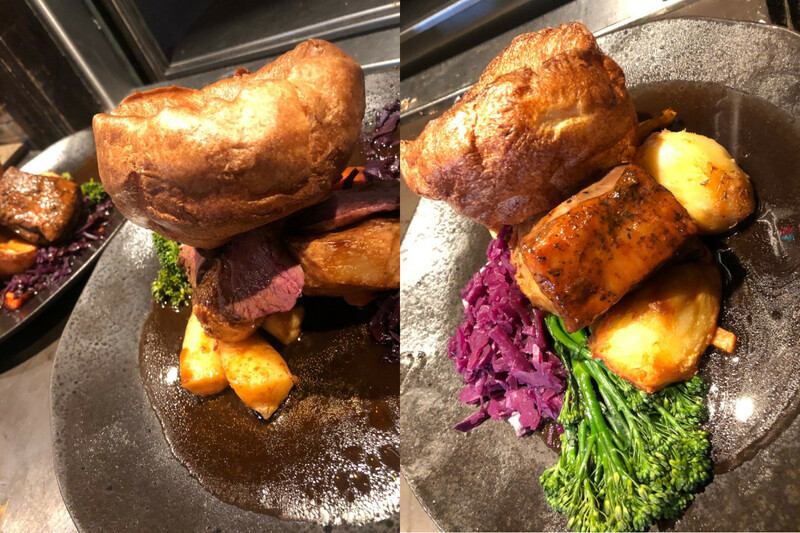 Their recommended roast is the British beef sirloin, grazed in the West Country and cooked to perfection, then thinly sliced for the ideal cut. The Victoria also cater to your dog’s roast needs. They have free dog treats and a ‘doggy beer’ for their furrier, four-legged customers. Served up with homemade Yorkshire puddings, roast potatoes, tenderstem broccoli , pickled red cabbage, orange glazed carrots and turmeric parsnips. The Green Goose, named after the debaucherous Green Goose Fair from the 18th and 19th century, is a hidden East End gem offering hearty portions. Their head chef recommends the 28 day Aberdeen Angus sirloin of beef. He ‘slow cooks the rolled joint for 8 hours, finishing it in the flames of their coal fired robata for the perfect melt-in-your-mouth rare cut of beef’. The Green Goose has a walled beer garden for the sunnier Sundays, and comfy leather booths for those chilly ones you’d prefer to spend indoors. They also serve a range of vegetarian desserts (if you have any space left!). All the above are served with roast potatoes, honey roast carrots, parsnips, greens, peas & Yorkshire puddings. 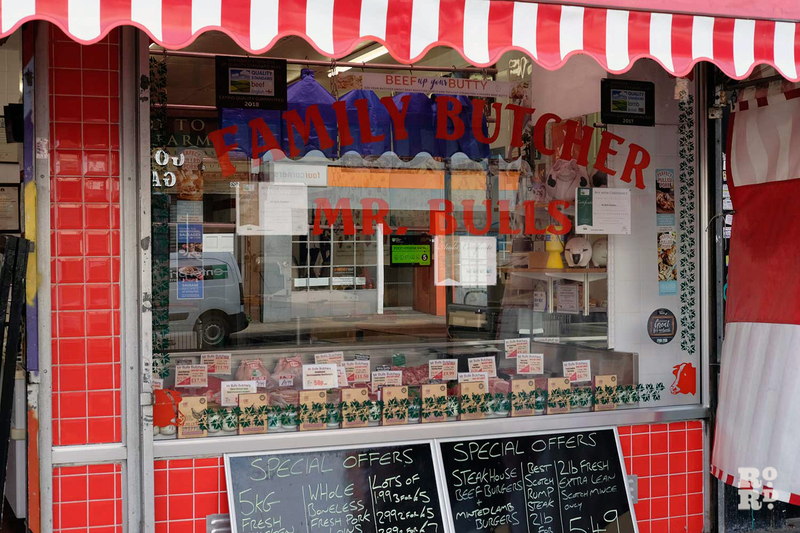 Their cheapest roast comes at £11.00 and £13.00 for cheapest meat roast. Just down the road from The Coborn is The Morgan Arms. This classic boozer has mismatched quirky furniture, a cosy feel, and an unpretentious, grounded atmosphere. The spacious ground floor half circles the bar, and with the large windows, creates an honest, open feeling. Their roasts conjure up that same idea; honest good food. Locals have said they feel the portions are large and filling, that their roasts are a ‘must’ for the area. They recommend their Roast beef, served with horseradish cream and plenty of roast potatoes, parsnips, honey and ginger carrots that look delicious on the plate. You also have the option to buy a gift card at The Morgan Arms so you can pass on that delicious treat to someone dear. All served with roast potatoes, cavolo nero, parsnip puree, honey & ginger carrots, gravy, and Yorkshire puddings. 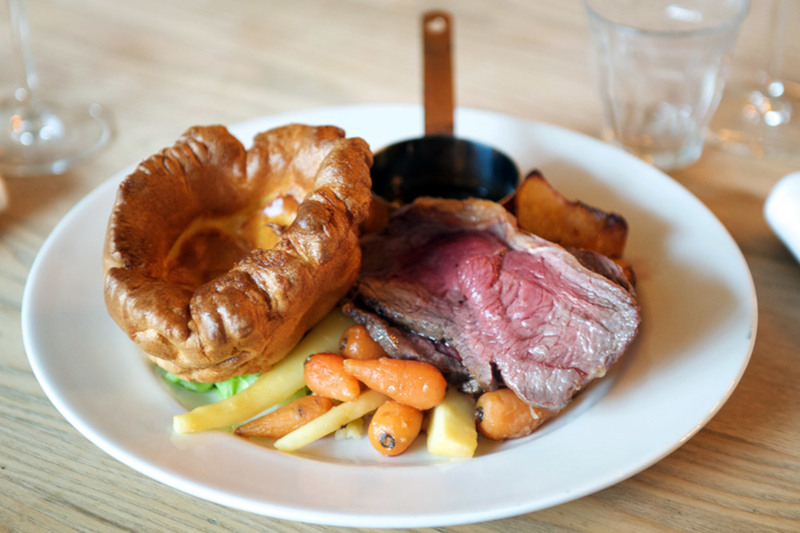 If you enjoyed reading about the best Sunday roasts in the area, you might like to know the best pubs to watch the Six Nations or the best places to get coffee.